This time they fixed the typo. Did you catch it last time? I’ll review the phishy aspects of this email. All of these are red flags that should make you suspicious. If you feel suspicious then it is likely a scam and you can delete it. Always feel free to ask us too. You are being asked to login and update your email address. The subject is pretty generic. The From is miami.edu and not augsburg.edu. The message is not TO: you, it is BC: (blind carbon copied) at you. If you clicked on the link (which you should not!) it goes to www.verderural.com.br which looks a bit odd. Shortly after the above email another phishing email was sent that represents a more standard attack. Let’s count the red flags. 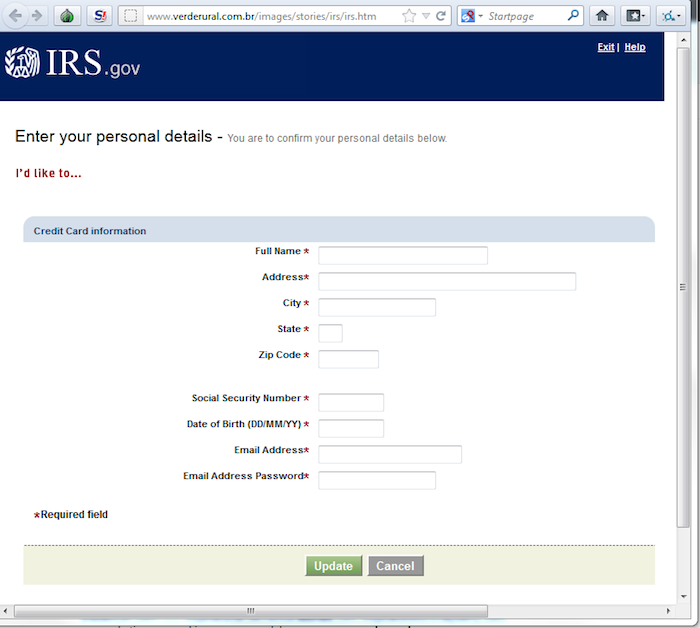 The From is info@security.com (not the IRS). There is an urgency to the message and it involves taxes. 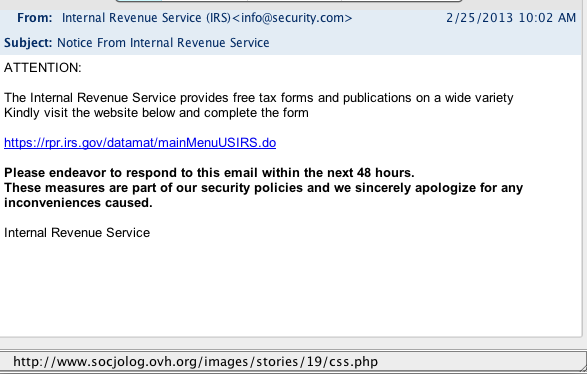 Why would you need to visit a website about tax forms within 48 hours? The web address actually goes to a totally different website (see below). Many email programs allow you to move your mouse over the link without clicking on it. That way you can see where the link will go before clicking on it. My GroupWise client shows the link at the bottom of the email window (shown below). In both cases the actual destination is not the same as what the link appears to be in the email (big red flag). 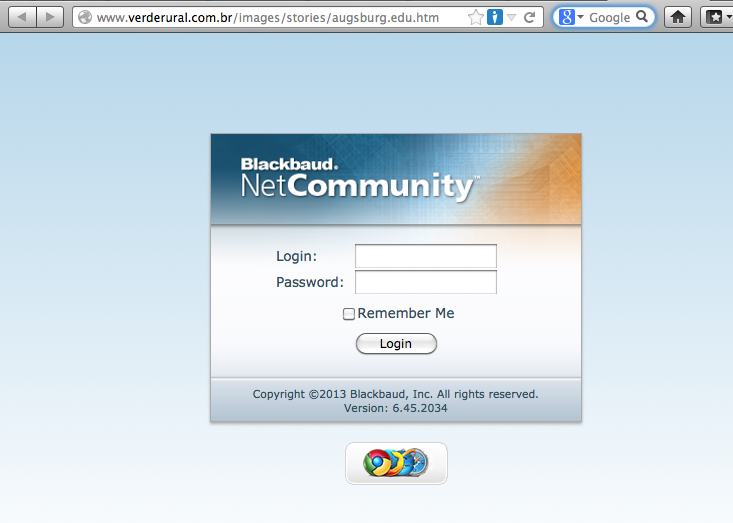 This time I took a picture of the first login page before we blocked it on campus. They made a copy of one of our web pages to try to fool you. Even though the page doesn’t have any Augsburg logos it looks rather official. But again, if you did click on the link (which you should not do!) notice the web address in the browser address bar at the top. There is nothing there that looks familiar and the .br (Brazil!) should be a big red flag. The second phishing email’s website is very very tricky. See below. Let’s see what red flags exist on this web page. The address in the address bar is .br (Brazil). That should be a big red flag. The web page is asking for your Social Security Number and birth date. Those should set off your alarms right away. Those two pieces of information are critical to your personal information security. You should never be entering those online in response to an email. Those two pieces of information are the keys that gain entry into your whole personal financial world — guard them like they are made of gold. What should I do if I did enter my password? The first thing you should do is go change your password on Inside Augsburg. Don’t worry if you can’t login to change your password — try to use the “Forgot password” link to reset it. If you can’t reset it just call the Tech Desk or your LFC to get your account unlocked. It is very likely that if you gave up your password that they are already sending spam and Augsburg IT will detect the 100s of emails being sent and will have changed your password to lock out the phishing attacker. After you have changed your password be sure to update your phone and other mobile devices with the new password. And to illustrate again, here is another student video this time from CalPoly Pomona. We just had an aggressive phishing attack on the campus. What is phishing you ask? It doesn’t mean salmon or cod are trying to get into our classes. Phishing is when someone is trying to trick you into giving up personal information (username, password, financial info) by pretending to be someone else. There is “bait” to “lure” you in. They often use that info to take over your email account to send spam but sometimes may try to get at your personal information and financial accounts. There is not a perfect test to recognize phishing but you can look out for these red flags. Also, if something seems suspicious it’s probably a scam and you should just delete the message. You are being asked for your login, password, or being directed to go to a page and login. The message seems to come from out of the blue. The message is poorly written or has spelling errors. It is telling you this is urgent, important, you will lose access if you don’t act now. They are trying to scare you. The From: doesn’t match the content of the message. Keep in mind the From: can be made to be anything (just like postal mail, I can send you a letter and put the from to be “President of the United States.”). If you do click on the link (though we recommend you do not) be sure to look at the address in the address bar. Augsburg IT will not ask you for your password and will generally not ask you to login to a website. Let’s look at the recent phishing email and see how many red flags it raises. There is a typo (can you spot it?). The From is wisc.edu and not augsburg.edu. If you clicked on the link it goes to alldayivebeenthinking.com/wp-content/themes/augsburg.edu.htm which looks a bit odd. This video by students at Cabrillo College will help you remember to watch out next time.